What you want? We got it! Although I enjoy house music a fair bit, I tend to listen to it less overall because a lot of it is rather dull and listless, or it just doesn't stand out among the rest. And on occasion, it's just downright awful (as in "Put Your Hands Up For Detroit", the biggest dance hit from the summer of 2007). But occasionally, something truly impressive comes along that revives my often ailing interest in the genre. Enter [insert their real names] -- also known as The Disco Boys. They have been cranking out high-quality funky tracks for a few years now, but the one that has particularly stood out for me is their 2007 single, "What You Want". This is exactly the kind of song I need to revitalize my interest in house music. In natural fashion, the single starts off with none other than a Radio Edit. It has a very deep bassline and a suitable organ to begin the tirade of sound, moving forward into the male vocals. Oftentimes they snag a sample from some old song, but not in this case! 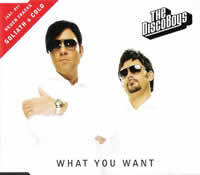 The chanting of "We know / what you want / What you want / we got it" is not as annoying as it sounds; in fact, it's quite endearing and exhilarating, especially to a strong house beat. Occasionally, the song will slow down to its bridge with an 80s-style synth with a very simple but suiting melody before returning to a grand climax with all the elements mentioned prior. It's a grand cacophony of retroactivity, one that shouldn't be missed from these guys! The Club Mix may seem similar at first, but boasts a different arpeggiated electro-synth bassline that gives it an even bigger kick than the Radio Edit. If you want even MORE energy (though the previous track should serve as a source of adequate power), this is the place to look! Meanwhile, the Extended Version serves exactly as it sounds: a longer build-up and cooldown for the Radio Edit, so if you loved that, you'll love this too. But the fun doesn't stop here just yet, as the DJ DLG offers his take on the matter. It has the same general style as the original, but an alternate melody to back up the vocals. It, too, is equally infectious, though it seems to want to hog the spotlight from the vocal samples. Still, I have no doubt that it would get toes tapping on the dancefloor just as easily as the original -- and it even plays with the vocals just a little bit more (including making them much lower pitched at a certain point just for the hell of it). The first four tracks, making up the main course of the single, are definitely appetizing. Ah, but what you want is to leave room for dessert, and that's what we have here in the form of two full-length B-Sides, both of which have something of equal value to offer. Goliath has a hook that is very straightforward and does not even try to hide itself; the upfront bassline (and later, additional synths to pad the melody) make no apologies when attempting to cause your feet to shuffle, and they will do just that. It's not a complex track by any means, but in its simplicity is pure funk. It almost has a street vibe to it, and to that I raise my glass. I generally do NOT skip over this track; it is exactly what a person needs when they need to be perked up! The other B-Side, Cold, is not quite the same. Instead, it is direct house music and perhaps my least favourite track on this single. That's not to say that it is bad by any means, for it is indeed decent as well. However, the hook is not as strong here (or at least not for me). The difference is that, aside from a more tubular-sounding bassline, there is also female and almost diva-like vocals, reminiscent of early 90s dance hits, as well as a prominent piano. While the production values are clearly there, I have not been awestruck by this track as of yet. It's definitely groovy, but I prefer "Goliath" in the long run over Cold (and the title track, "What You Want", over them both, of course). There's something for everyone available here. The entire single oozes with house and disco funk and can easily bring a party full of yawners to a new level of euphoria -- and no drugs, alcohol, or strippers required! It delivers exactly the feeling that house music was designed to: booty-shakin' action! This Disco Boys single? Yeah, it's what you want.